This function allows the users to create a new allowance application or review existing applications. Refer here for the complete list of allowance types setup in the system. Click on the Add button to create new application. You will be directed to the Allowance Application page. In the Student Details section, enter the values in the Allowance Start Date, Allowance End Date, Distance from home to School (one way), Bank Name, Bank Account Nbr fields. Note: Verify that the application date is correct. Also verify that the duration of the application is one year. 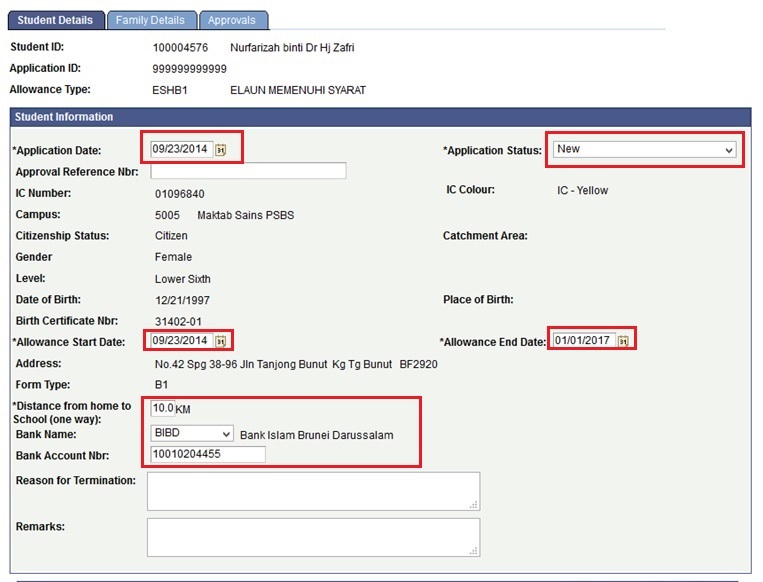 Application Date: The date of when the application is applied, by default this is set to the current date. Application Status: A dropdown selection list of the status of the application, by default on new application before being saved, its set to “New”. Allowance Start Date: The start date of when the allowance started. Allowance End Date: the last date of the allowance period. Bank Account Number: the account number for the applicant for disbursement. It’s only used for applicant applying for Living allowance for the time being. 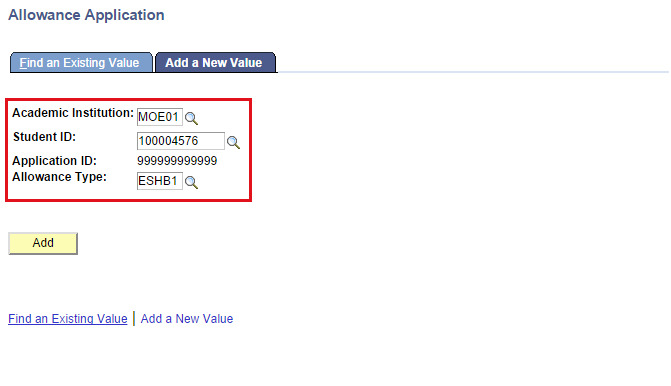 In the Family Details section, verify the student’s Father, Mother and Guardian details. Monthly income: The father/mother/guardian’s monthly income to support the family, Required for some allowance type like SMN. Place/Position: The position of the father/mother/guardian in their work place. If Father/Mother has passed away please state the date of Death: like stated, it’s the family date of death. Required when father/mother details is not populated. 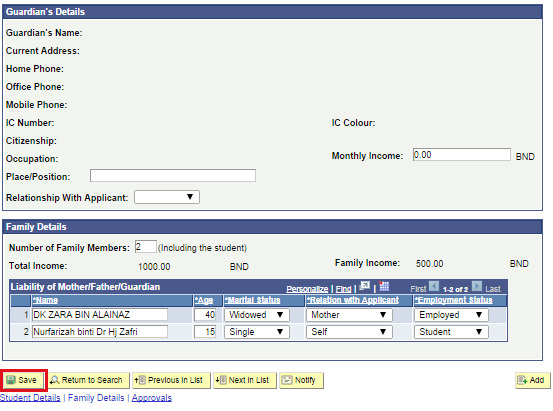 If father and Mother Details are blank, contact the school registrar to populate those values or instructions can be found at http://help.ineis.moe.gov.bn/sr/sr_1.7.php (Manage Student Family Details). If the father, mother or guardian has passed away, please key in the date in the application. Below, the Guardian Details, there is Family Details this is where you list out the family members. First you enter the proper number of family member in the Number of Family Members fields and press “Enter”, the list will be the same number of rows as you enter in the fields. 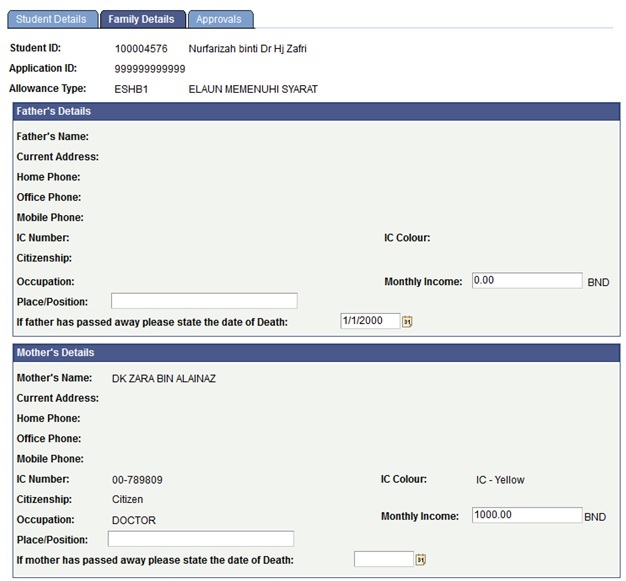 Enter the family details into the Name and Age fields and select from the dropdown options for Martial Status, Relationship with Applicant and Employment Status. Age: The age of the Family Member. Should be their age of current year whether their Birthday pass or not. Martial Status: Whether the family member is married, widowed, single, divorced or separated. Relation with Applicant: The relationship of the family member to the applicants. 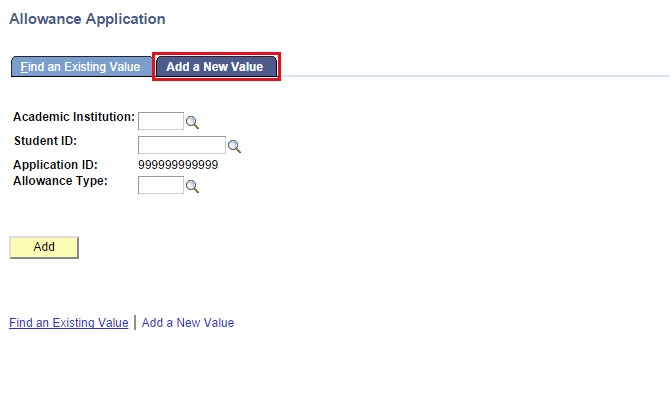 Note: if it’s the applicant themselves, please select “self” on this dropdown field. Employment Status: Whether the family member is employed, unemployed or a student. If the application meet all the criteria setup in the Allowance Type Setup page, application will be routed for approval and Application Status in student details tab will be updated to “Pending Application Approval”. If the application does not meet any one of those criteria, the system will generate a popup message that the application will be rejected automatically and Application Status in student details tab will be updated to “Rejected” when the application is submitted under those circumstances.